The average rate for a 30-year loan now stands at 4.1%, according to Freddie Mac. That matched its lowest level since June 2013, when it stood at 3.93%. The average 15-year fixed was 3.23%. The government's stimulus program has helped keep borrowing costs down. The Federal Reserve has been purchasing Treasury Bonds and mortgaged-backed securities for years, providing a steady market for mortgages. But the Fed has cut back on its purchases, and plans to end the buying program entirely in October, reducing demand for mortgage bonds. That should eventually cause rates to climb. 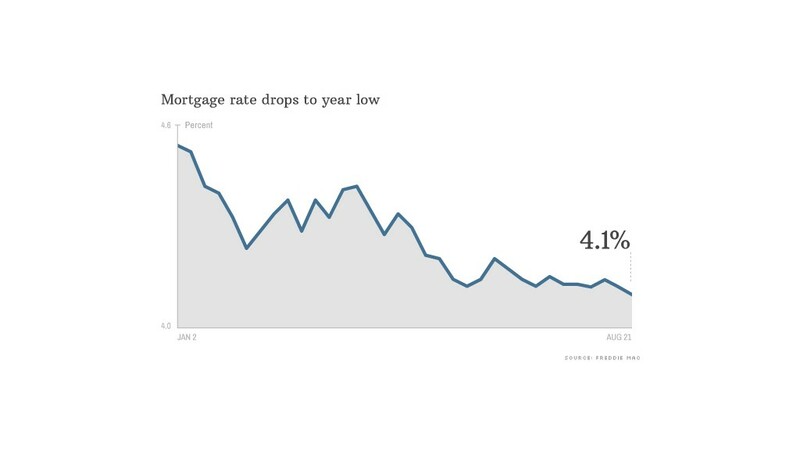 Low mortgage rates and home prices that are climbing more slowly should boost the housing market, said to Keith Gumbinger, spokesman for HSH.com, a mortgage information company. "That should provide a solid foundation for home sales this fall," he said. It was a strong summer. Stronger job growth has boosted the market, according to NAR's chief economist, Lawrence Yun, and a larger inventory of homes on the market give buyers more to choose from. "That's making prospective buyers less hesitant about entering the market," he said.